Netherlands with its capital Amsterdam is located in Europe (Western Europe, bordering the North Sea). It covers some 41,544 square kilometers (slightly less than twice the size of New Jersey) with a population of 17,084,700. Dutch and Western Frisian are the languages spoken by people in Netherlands. As an interesting fact, is sharing borders with Belgium and Germany. Netherlands is a Benelux country, bordering Germany to the east and Belgium to the south. For many foreigners, nothing captures the idea of the Netherlands more vividly than windmills, wooden shoes, tulips, and remarkably flat lands. Wandering through the magnificent city of Amsterdam, with its lovely canals and hundreds of 17th century monuments, is a delightful experience. For most people, a visit to The Netherlands would not be complete without a good day in its bustling capital. Nevertheless, it is only one of many towns in the country that offers a beautiful, historic centre. To reach someone Netherlands dial +31 prior to a number. The local cellular networks are operated on 900 MHz, 1800 MHz, 3G, 4G. Websites typically end with the top level domain ".nl". If you want to bring electric appliances (e.g. battery chaarger), keep in min the local 230 V - 50 Hz (plugs: C, F). The sign for the locally used currency Euro is EUR. 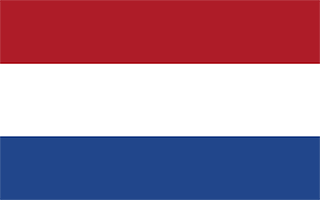 Three equal horizontal bands of red (bright vermilion; top), white, and blue (cobalt); similar to the flag of Luxembourg, which uses a lighter blue and is longer; the colors were derived from those of WILLIAM I, Prince of Orange, who led the Dutch Revolt against Spanish sovereignty in the latter half of the 16th century; originally the upper band was orange, but because its dye tended to turn red over time, the red shade was eventually made the permanent color; the banner is perhaps the oldest tricolor in continuous use.